This is the shop for the Padma Karpo Translation Committee (PKTC). It features a wide array of materials for those intent on studying the Buddhist tradition: books, translations, dictionaries, Tibetan software, and Tibetan fonts. There are many translations of the key texts of the Kagyu and Nyingma traditions, especially on the topics of Dzogchen and Mahamudra. To read about and purchase them, use the products link at the top of the page or the button just below. We also specialize in Tibetan dictionaries, including the Illuminator Dictionary, which is widely regarded as the best Tibetan-English dictionary available. 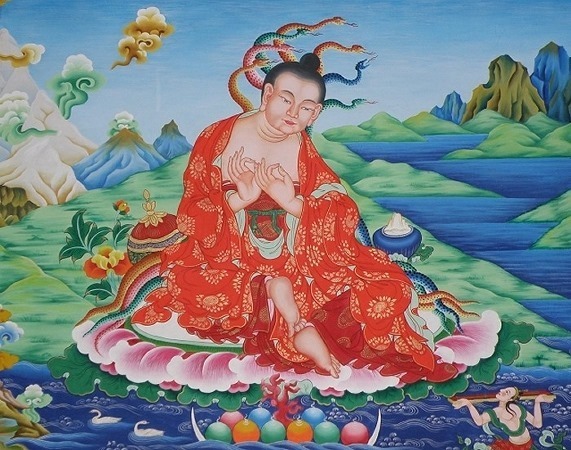 The picture to the right is of a wall mural at Dzogchen Monastery, Tibet, where Lama Tony, the founder of PKTC, spent several summers receiving extensive teachings in Tibetan on Buddhism in general and Dzogchen in particular. The image is of Nagarjuna, a great Indian Buddhist master and scholar. This book contains the most complete explanation of Other Emptiness in English to date. The book was written by Tony Duff based on many teachings on Other Emptiness and Self emptiness that he heard from various masters during many years. He translated and included many Tibetan sources as supports for the book, including a text on the source of the Other Emptiness teaching by Khenpo Tsultrim Gyatso. It is an excellent companion for the several other books on Other Emptiness available in this store. It is one of our best-sellers. This book features fresh translations of Samantabhadra's prayer and the sutra from which it is derived, and in-depth explanations of the prayer, supported by commentaries by Nagarjuna, Tenpa’i Wangchuk, and many other early masters of the Indian tradition and top translators of the Tibetan tradition. There is a very long introduction that covers all aspects of the prayer. The book comes in two volumes; this is the first volume and the second volume is also available in this shop. The translation of the prayer is a fresh translation that relies on the commentaries of several early Indian masters and some of the great early Tibetan translators to give a very exacting translation. Ample footnotes clarify many points of how the words of the prayer should be understood. Introduction, translations, ample footnotes, glossary, and book design by Tony Duff. This book features fresh translations of Samantabhadra's prayer and the sutra from which it is derived, and in-depth explanations of the prayer, supported by commentaries by Nagarjuna and many other early masters of the Indian tradition and top translators of the Tibetan tradition. There is a very long introduction that covers all aspects of the prayer. The book comes in two volumes; this is the second volume and the first volume is also available in this shop. The translation of the prayer is a fresh translation that relies on the commentaries of several early Indian masters and some of the great early Tibetan translators to give a very exacting translation. This volume features a commentary by the contemporary Tibetan Dzogchen master Tenpa'i Wangchug, that gives many practical details for the use of the sutra. Introduction, translations, ample footnotes, glossary, and book design by Tony Duff.